Coffee cake of the Month Club for sale. Buy online at Zingerman's Mail Order. Gourmet Gifts. Food Gifts. A new coffee cake every month, delivered to their door. Our coffee cakes aren’t built on any secrets. They're also not built from too much sugar, shortening or other shortcuts that mar the flavor of many "gourmet" pastries that look nice but taste bland. These are the product of great ingredients, solid recipes and a lot of tender care. They're our most popular gift—we ship thousands to food lovers across America every year. Enter our coffee cake club, and you can send our top-selling coffee cakes over and over, month after month. 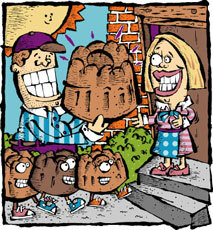 They'll have the opportunity to try all of our most famous coffee cakes, one per month. Just as they start to miss the one they finished off a couple weeks ago, a new one will show up. Your delicious gift will arrive in our printed gift box for up to twelve months, making your succulent sentiments hard to forget. A gift subscription makes a great business gift. Each cake serves 5-7. $10 extra per installment for shipments to Alaska or Hawaii.